As the constantly hot stamping press continues to sizzle today I have a new indie brand to share with you called Nail Matinee. I discovered these plates via a mutual stamping fanatic and put some feelers out to find out the who, where, when, what, and how. I was able to find them stateside right from a homegrown company called Beautometry which some of you may already know about. So now I can share these plates with you all today. A brief note before I get started, normally I would have put up a Hot Off The Stamping press release for new brands, but given the recent fiascos with unscrupulous sellers I will be reserving those posts for established brands with which I have experience or that I have already reviewed personally as I am doing today. As usual this post will be broken in to sections that you can scroll through. Please don't forget to leave feedback, questions, comments, or concerns you might have. Now let's get started! Started by Indian, as in Asian Indian not American Indian so as not to create confusion, stamping fanatic Nisha Sharma. She also has also produced her own line of stamping polishes which are currently not available in the US. Run by a local-ish girl pal Therese Vogel. She's pretty dedicated to bringing US based ladies things that we otherwise cannot get our hands on readily in the stamping world without group buys, espionage, smuggling, etc. Right now she stocks brands from all of the world including Nail Matinee, Apipila, Chez Delaney, NailWays, and more. Its actually a little insane when you look at the global coverage she offers. As a connoisseur of plates all over the world I find this just damn awesome! But don't take my word for it go take a look yourself and while your at it give my girl a follow! Now let's hop back into the review! 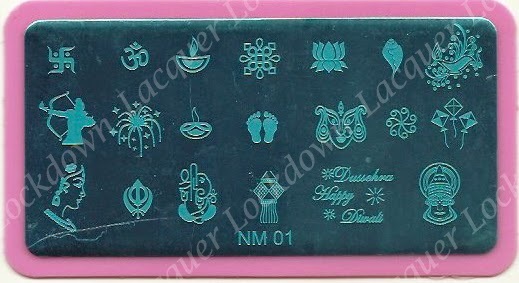 So far there are 4 plates in the NM series. Like a lot of new plates out on the block these feature the medium toned pink backing that we've grown accustomed to from other brands. Plates with full sized nail images feature 12 images while the plates with smaller accents tend to feature between 14 - 20 images give or take a few. The plates themselves measure 13.1 x 7.1 cm length by width. 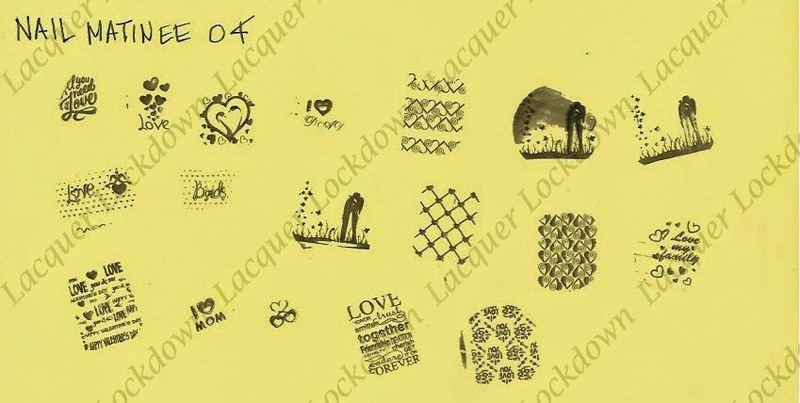 The image size on the Nail Matinee plates are almost standard sizing measuring 2.0 x 1.7 cm length by width but they can and do get larger for a few of the images as you can see above. 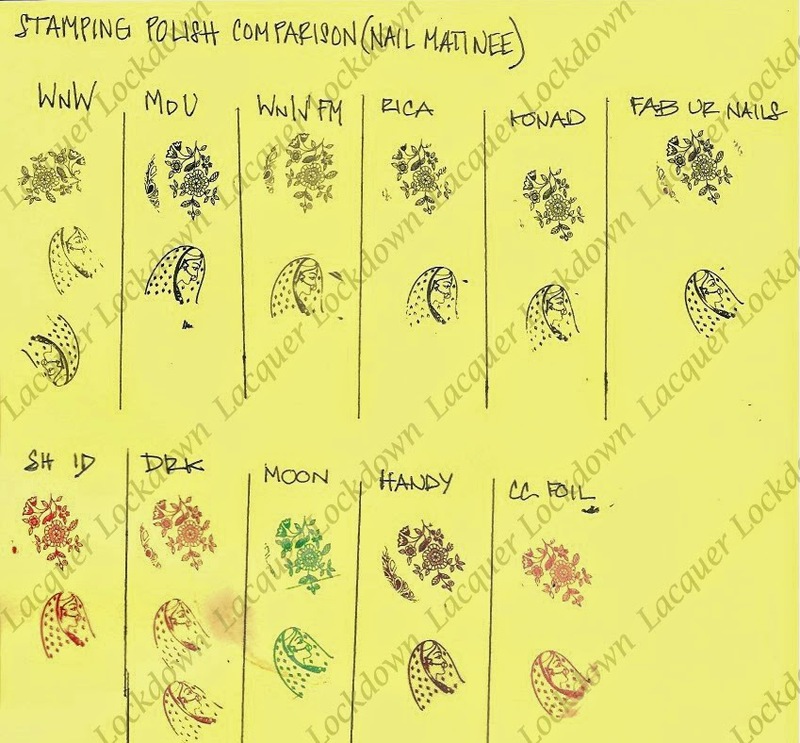 While I listed out a few different brand below you can check out a more complete comparison of the plates on the full sized nail image chart I created. You can view that here. For the most part the standard sizing of these plates will work well for medium to short nailed ladies. For us longer nailed ladies some double stamping may be required. By now if you regularly check out my reviews you should know the drill. I swatch all my images out with basical Wet N' Wild Black Creme and my gold standard XL marshmallow stamper from Bunny Nails (4 years old). 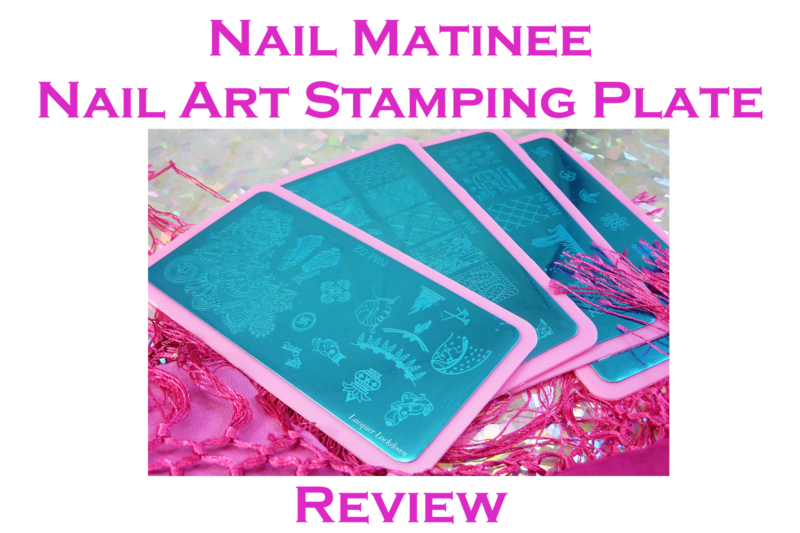 When I want to pick up larger images I use my marshmallow stamper from Magno Nails. I only switch to Konad Special Stamping polish or Mundo de Unas when I am unable to pick up an image. I did not have that problem once with these plates as the etching was superb. The why of why I use Wet N' Wild Black Creme for my swatches is because it's cheap and readily available. The cheap is a big part when you swatch and review as many plates as I do. It also happens to be the lowest quality polish I can use for stamping. Which means I don't expect images generated by WnW t the clarity of those generated using a polish made specifically for stamping. 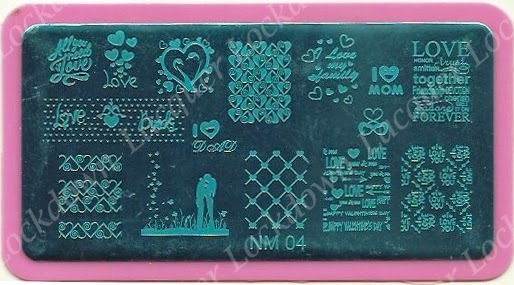 Stamping polishes allow an image to stamp with even more clarity and crispness than regular polish. 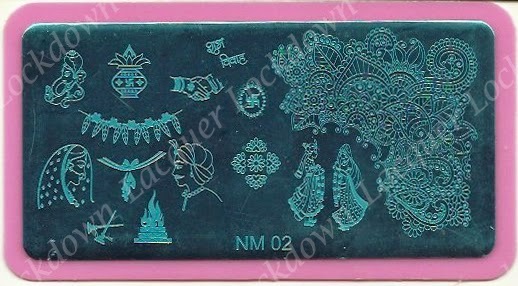 So the bottom line is a plate that stamps well with cheap WnW polish has superb etching because it generates great images even when stamped with a polish not meant for that purpose. Are there other stamping polishes or just polishes in general that you'd be interested in seeing swatched? I'm trying to change it up each review so let me know if you have some favorites or brands that you want to see in this line up. This time I added in DRK into the mix. The plates i used for these comparisons are NM02 and NM03. So here we are at the end of another epic review Lacquer Lockdown style! Every time I finish one of these I just am blown away lol it's a lot of work. So about these plates hey have what I called extra fine super etching. I'm not kidding! Look really closely at the lines on these plates and the swatches they are super fine and as such if the etching is not dead on you will be left feeling very frustrated. Yet here we have an example of plates with such incredible etching the extra fine lines pick up even with cheap Wet N' Wild! Really really spectacular! I was so impressed when I was looking at that henna plate swatch out I almost died. The fine details - gah! So at the end I have to say these plates are beautiful and will be totally worth your money even if you want to select one or two. My stand out favorites are plates 02 and 03 as they both feature images with no compare on the market! These plates retail for $8.50/plate on the Beautometry site but if you spend more that $50 and really that is just so easy to do when you look at all the products that are being offered. Heck she even has FUN Lacquer which a super guilty and super decadent pleasure of mine. Again please don't forget to leave me any feedback or questions you might have! Thanks so much for reading and happy hunting! I don't know if lately I'm being picky because I have that dreadful ban, but to be honest, I'm not excited nor impressed about this. I mean, the quality seems amazing and I liked some of thoses designs (The henna plateeeee~!) but I don't feel that "thing" that makes me crave a plate. Thanks for the amazing review (as always) and for talking about beautometry. I've heard of it but never checked the page. They have so many brands that I haven't purchased before for the same reasons you mentioned above, so I'm happy to find this piece of heaven. See you in the next post, darling! (yes, I'm still trying to catch up lol). I think it's easier for me imagine how the backgroud would be and then go from there than seeing the image and then imagine the rest. Sometimes it's easier when I have a theme in mind (right now all I've been doing is avengers related so I only look for images and plates in my collection that can go with the "avenger of the week" lol). I saw a beautiful mani that used plate #4 and had to get it. I am not much of a stamper but I have really liked this plate. 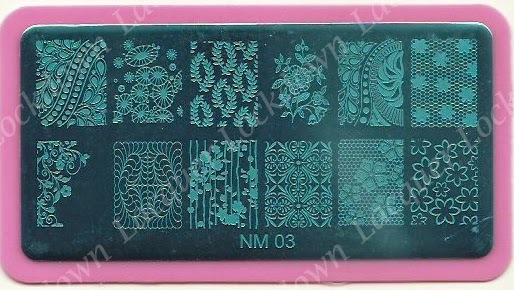 Since I am so new to stamping, my plate collection is not much. I was very glad to add this plate to it! I'm glad you found one you liked! I haven't seen too many mani's with these plates but I like them a lot!